An extended linked detached family home, situated in the heart of this popular residential area within a level walk of the village and the amenities. The property has been improved over the years and features a sitting room, recently refitted kitchen/dining room, large utility room with cloakroom off. 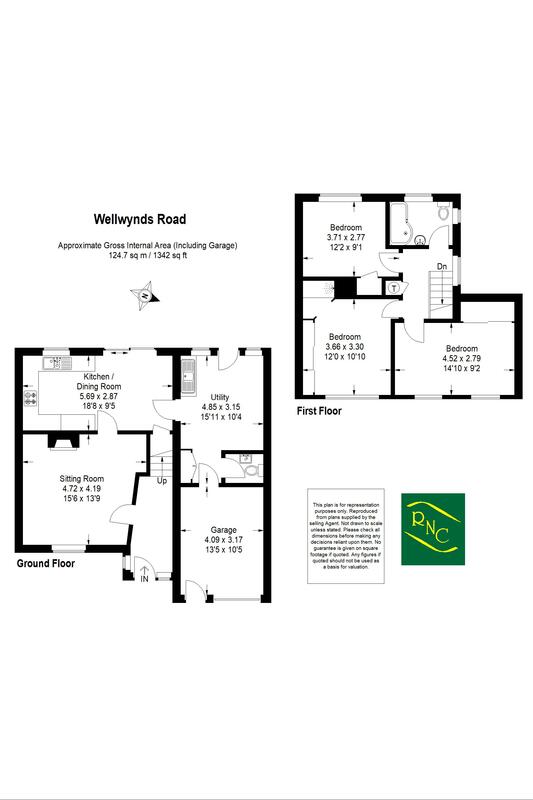 On the first floor there are three double bedrooms, all having wardrobe cupboards and the master bedroom has a modern fitted shower enclosure in addition to the family bathroom. The rear elevation enjoys a bright and sunny westerly aspect overlooking a beautifully landscaped and tended garden. Outside there is plenty of off road parking with an extensive brick pavior driveway leading to the garage. The property benefits from solar panels that provide an additional annual income. We highly recommend a visit to fully appreciate the accommodation on offer. From our office turn left into the High Street and proceed to the second mini roundabout, bearing right into the Horsham Road. Take the second right into Hitherwood and then second left into Wellwynds Road and Number 18 will be found on the right hand side. A superb feature of the property having a comprehensive range of gloss units under extensive work surfaces with one and a half stainless steel sink, four ring gas hob with extractor hood over, electric double oven, range of wall mounted cupboards, integrated fridge, freezer and dishwasher, range of pan drawers and cupboards. Sliding patio doors in dining area, understairs cupboard. A good size room fitted with stainless steel single drainer sink with space and plumbing for washing machine and tumble dryer. Doors to garden and garage. Comprising; WC, wash hand basin. Access to roof space, linen cupboard with hot water cylinder. Front aspect, range of fitted wardrobe cupboards, modern fitted shower enclosure with thermostatic shower. Front aspect, range of built-in wardrobe cupboards. Rear aspect, built-in wardrobe cupboards. Fitted with suite comprising; panelled bath with shower over, wash hand basin, close coupled WC, tiled walls, low voltage down-lighters. The property is approached via an extensive brick pavior driveway providing plenty of off road parking and leading to the garage. The driveway is flanked by neatly landscaped flower and shrub borders and low hedging. The rear garden is a delightful feature of the property being beautifully landscaped having paved patio stepping onto shaped lawns with well stocked flower and shrub borders around, ornamental fishpond with waterfall, paved pathway leads to the end of the garden where there is a timber gardens store. The garden enjoys a bright and sunny westerly aspect to the rear and is enclosed by panel fencing and hedging. Up and over door, two personal doors.